Before Hadley, there was Vika. My knitting life has had surges and lows where I’ve destashed completely and jammed everything in a drawer. That was mostly due to life—babies, toddlers, then multiple babies and running. It was mostly due to running. I have a hard time not getting completely consumed in activities. When I am training for a race, I’m all in. And apparently, when I’m not training for a race (or it’s winter), I find other things to obsess over. 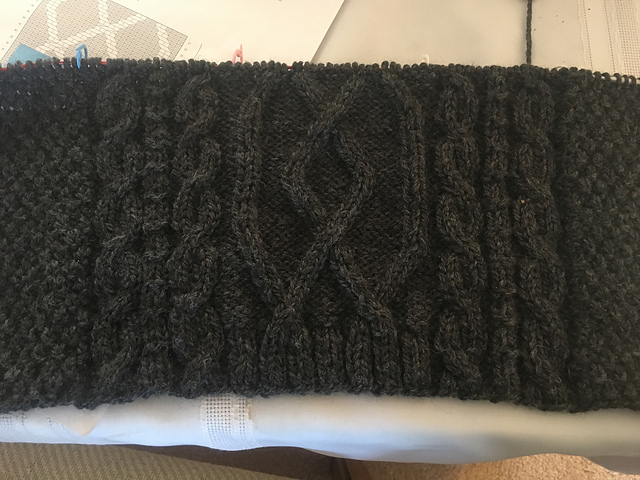 Like my first cabled sweater. 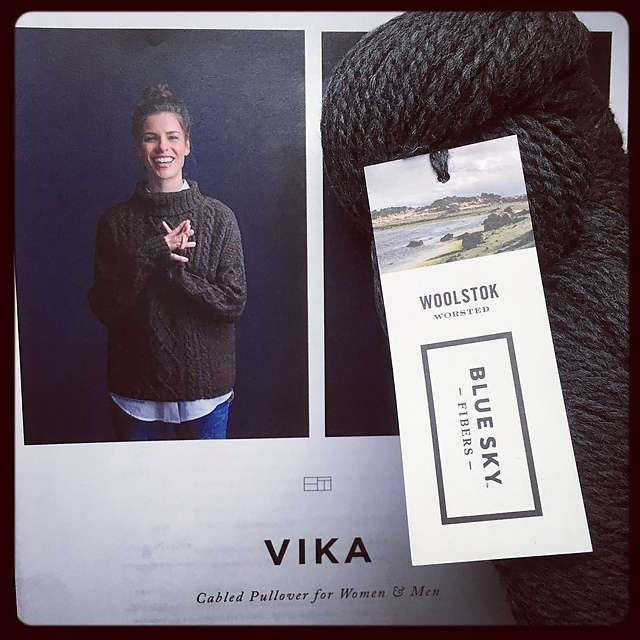 I decided to go lower budget than Shelter, and Woolstok is the workhorse it’s advertised to be: consistent, sturdy, an all-around fantastic worsted wool yarn. And I love it. It seemed perfect for Vika. Vika was one of those projects I started around the holidays and kind of poked at off and on. It seemed an almost insurmountable task, which at times made me reluctant to pick it up. Why bother? It’s going to take forever. At some point I decided not to focus on the end result but try to enjoy the act itself. As corny as it sounds, I wanted each stitch to stand on its own. Be a meditation. I wanted to enjoy knitting every single stitch of this sweater until I the very last stitch was bound off. In the end, after some seaming I’ll admit I just made up as I went along, I had my first seamed sweater. And I am mostly pleased. But it’s too big, and it is heavier than a sweater I want to wear on a regular basis for activities not limited to just sitting on the couch watching Netflix. Lessons learned: ease is great, but I tend to go overboard. I also need to remember that I am 5’1″ tall and not as tall as the models often shown wearing these garments. Too much ease is overpowering on my short frame. So is length. And it’s possible that if I’d knit this in a lighter yarn like Shelter, that the ease wouldn’t bother me as much. So there will be a Vika 2.0, knit in the proper yarn, in the proper size. Until then, I’ll search for a worthy recipient; it pains me to see it languishing unworn on the shelf. unworn. I love it. Job well done for some lucky person. I love it! I don’t even think it looks too big, just cozy. You did a fantastic job; seaming sweaters is not fun!